The perfect gift for you and your significant other. 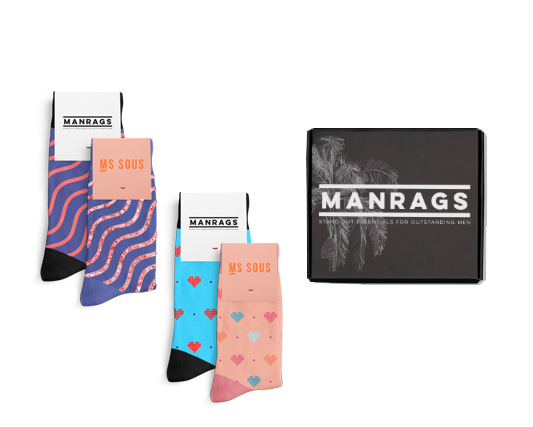 Two pairs of MANRAGS and two pairs of MS SOUS' that match - ‘cos couples who dress together, stick together. Made from Egyptian cotton so you can both brag about having the comfiest socks in the room. Limited boxes available! Designed in Australia and made in Egypt from the finest, long staple Egyptian cotton. Woven using 200 needles guaranteeing that these will be the most comfortable and durable socks you’ve ever worn. Men’s socks are OSFM (US sizes 7 - 12). Women’s socks are OSFM (AU sizes 6 - 11).